Tintswalo Safari Lodge is located on the private Manyeleti Game Reserve Concession, bordering the Timbavati Game Reserve, the well-known Sabi Sands Game Reserve and also open to the Greater Kruger National Park. These borders are unfenced and the Big Five roam freely in between these areas, allowing for superb game viewing whilst staying at Tintswalo Safari Lodge – a exclusive luxury lodge. A safari at Tintswalo Safari Lodge allows travellers to escape the stress of hectic business lives, ensuring total relaxation in pristine African Bush, among wild animals and an abundance of bird life. Sip cocktails on the deck of your lavish suite, whilst viewing Elephants drinking from the waterhole…Perhaps even a lion or two – this is Africa in it’s purest form! This is what makes an African Safari the ultimate break-a-way. 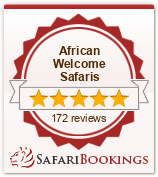 Tintswalo Safari Lodge is situated along a seasonal river bed, surrounded by ancient sycamore tree’s. The main lodge overlooks an animal watering hole – a meeting place of the Big Five and something to admire with awe, seeing how the animals interact with each other in the wild. Raised wooden walkways link the main lodge to the 6 exquisite Explorer Suites – with the super luxurious Presidential Suite in a class all of it’s own. The Tintswalo suites are authentically decorated to reflect the pioneering times of the nineteenth century African explorers. The air-conditioned suites are situated along the banks of the seasonal Nwaswitsontso River. Providing supreme comfort, privacy and an opportunity for effortless birding, as well as the chance to view a large variety of big game from the privacy of each unit. The indoor/outdoor shower leads off from the spacious bathroom which opens out onto the deck. Luxuriate in a private plunge pool or just relax on a lounger under the African Sun. Enjoy a relaxing Spa Treatment at the Vital Source Spa, followed by a sumptuous dinner under the Manyeleti night sky. At Tintswalo Safari Lodge, we know that this is your safari and your holiday, and therefore there is no prescribed safari routine. Your days at Tintswalo Safari lodge are designed around you, and you alone. An idea of a typical day on Safari, would perhaps begin with an early morning game drive in an open safari land rover with your ranger. How about breakfast in the bush? Followed by more game viewing. You can then return to the lodge for a light lunch and a siesta. Relax around the pool and delight in High Tea followed by a relaxing massage at the spa. Excitement now builds as you depart for another game drive in the late afternoon – watching the sun go down over the African Bush whilst sipping on sundowners. The night life now starts to emerge as your ranger points out the amazing animals only seen at night. You may even be so lucky to see predators hunting at night – seeing their eyes glowing in the rays of moonlight. Another satisfying day of game viewing, now satisfied – you return to your lodge for a romantic candlelit dinner. Be inspired and contact one of our travel safari planners now to design your South Africa Holiday.